You might be forgiven for thinking that a few screws might have worked loose among the engineers over at PSA, the parent company of Peugeot and Citroen. This week they proudly wheeled out a concept hybrid car powered by compressed air, apparently promising to unleash the awesome power of balloon animals onto the road by 2016. Actually, there’s a lot of cool-headed sense behind the Hybrid Air proposal. 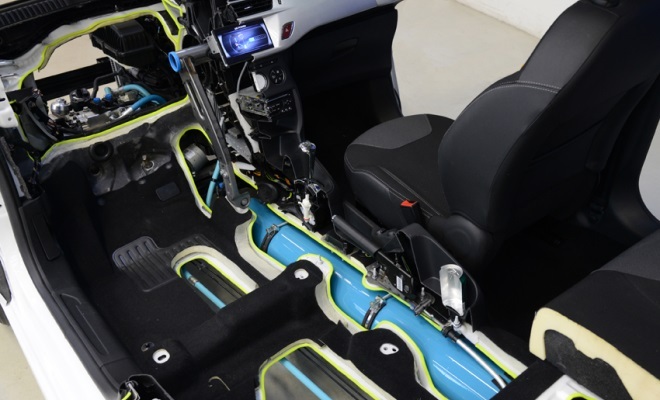 PSA’s notion is to create a hybrid that relies on well understood principles of pneumatics and hydraulics – advanced plumbing skills, basically – removing the need for any costly lumps of battery technology. 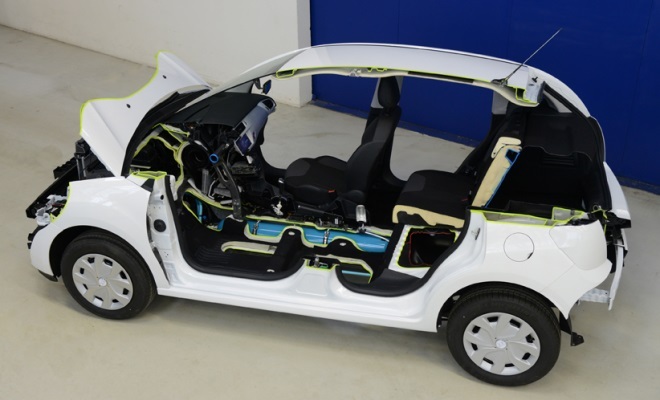 As a result, PSA thinks air-assist should prove to be a good way to boost the fuel efficiency of cars in the highly price-sensitive supermini sector. The basic concept of a hybrid is to take an ordinary car and add a system to capture, store and reuse energy that would otherwise go to waste, in the process reducing the need to burn as much fuel to get from A to B. So far, hybridisation has mostly meant adding an electric motor and batteries to a petrol or diesel engine. Handily, electric motors are reversible machines – put electricity in and they spin, or spin them and electricity comes out. This neatly means that a hybrid’s electric motor can double as a generator. When a hybrid car slows down, the motor is connected to the wheels and the momentum of the car spins the motor as a generator, stuffing energy into the battery (a non-hybrid car, by contrast, mostly turns momentum into waste heat in the brakes). When the hybrid needs to speed up again, energy flows back out of the battery, spinning the motor to propel the car along (either alone or in concert with the hybrid’s engine). Hybrid Air does much the same. In place of an electric motor it uses a conventional hydraulic pump and motor. And in place of a battery it uses a compressed air tank as its energy store. The PSA system offers one distinct advantage, besides cost. It employs purely mechanical processes, so there is great potential to build a system that is simple, responsive and highly efficient. In an electric hybrid, there are multiple energy conversion processes in the round trip from wheel back to wheel – from mechanical momentum in the car, through electromagnetic fields inside the motor, through electricity in the cables, and finally to chemical reactions in the battery, and then all the way back again. By contrast the journey from momentum to hydraulic pressure to air pressure and back again is a much simpler process. The big drawback? If you want to stuff a lot of energy into a compressed air tank (and not have it burst like an overstretched balloon) the tank will need to be both big and heavy. PSA isn’t quoting figures yet, but it will be doing very well if, for every kilogram added to the car’s weight, it can store even a third of the useful energy that an automotive lithium-ion battery might manage. 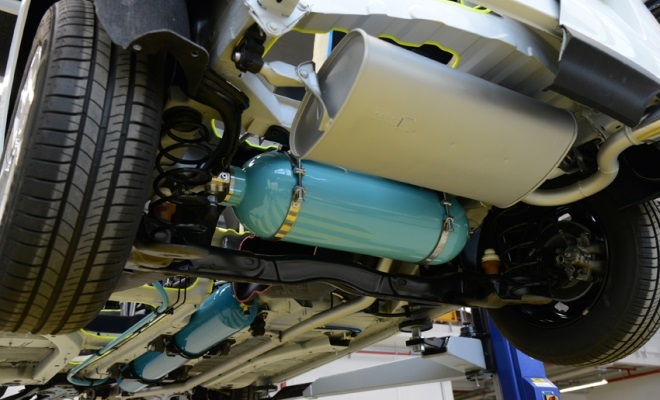 As a result, we are unlikely to see compressed air hybrids appear among larger cars, where the energy storage needs are greater, and weight would tend to increase in a viciously circular spiral. But for the small cars that are PSA’s bread and butter, Hybrid Air seems like a clever and very welcome piece of technology. Incidentally, PSA’s is not the first hydro-pneumatic hybrid proposal - see my 2008 report on the work of Scottish company Artemis Intelligent Power.